Ecological succession is defined as series of changes in the ecosystem where one community replaces another community as result of changes in the biotic and abiotic conditions. This phenomenon has been very important in determining ecological structures for as long as life existed on earth. The end goal of succession is a matured community of plants and animals referred to as a climax community. The climax community is a community which is able to maintain itself for a long time with small changes to species that populate it. There are two categories of succession, primary and secondary succession. Primary succession takes place in areas which were previously uninhabited such as sides of volcanoes. It is a very slow process. It is characterised by the arrival of small living things such as lichens and mosses which help break down rocks creating soils which can sustain small plants such as grasses and lead to climax communities. Secondary succession on the other hand takes place in an area where soil is still intact and mostly functions to repair a damaged ecosystem. It is a directional non-seasonal cumulative change in plant and animal species through time. Secondary succession is a fundamental ecological process which is important to the understanding of vegetation dynamics. This succession is composed of various stages; colonisation, establishment and extinction enacted by various species. Each species in the ecosystem has a set of environmental conditions under which it develops and reproduces. As long as these conditions remain constant, the species that are adapted to them flourish in the environment. Plant succession in particular begins when an area has partially or completely lost its vegetation because of a disturbance. This often leaves the soil exposed thereby accelerating erosion which limits the soil suitability to sustain any life forms. The disturbance can be due to natural disasters such as wind storms, floods and fire caused by lightning or human activities such as excessive veld burning and allowing overgrazing. MayFord Seeds’ Biomosome™ Eco-Matched Veld Seed was developed on the principle of plant succession. The Biomosome™ Reclamation range was purposefully formulated to contain a good balance of pioneer and subclimax species. The species selection is based on the vegetation types prevalent in South Africa. 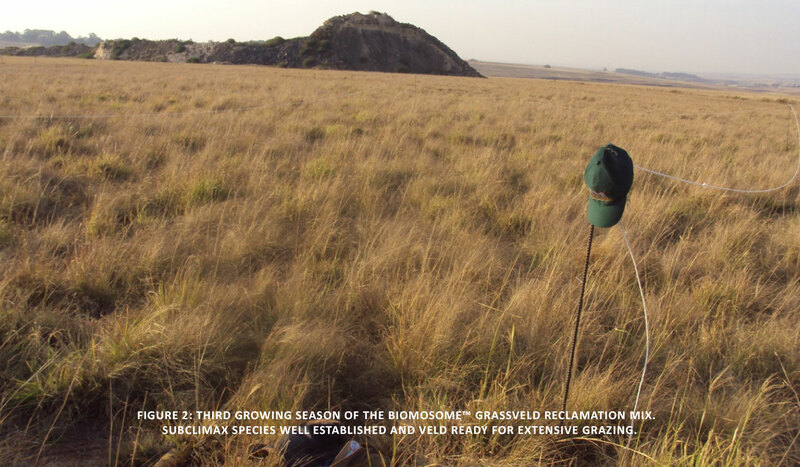 For example, the Biomosome™ Grassveld Reclamation Mix contains pioneer and subclimax species found in the grassland biome. The objective of utilisation of the Biomosome™ Reclamation Mix is to reintroduce pioneer and subclimax species in disturbed soils such as bare patches of overgrazed lands or land rehabilitation. This offers landowners the opportunity to initiate the plant succession and to manage the process to ensure sustainability. 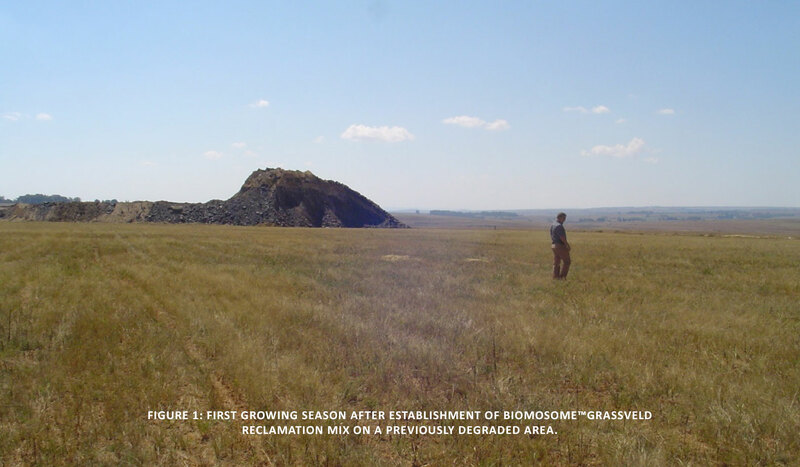 In 2011, we planted Biomosome™ Grasseveld Reclamation Mix on Northern Collieries, Carolina, Mpumalanga. This is a coal mine due for closure and rehabilitation is necessary to return the area to environmental suitability. Soil analysis of the area was undertaken and a fertiliser programme followed to address deficiencies and imbalances. The planting process involved cultivating backfilled topsoil, fertiliser incorporation, seedbed preparation, seeding Biomosome™ Grassveld Reclamation Mix and finally rolling. In the first season of growth volunteer weeds were left until grasses dropped their seed. In 2012, the grasses dominated and were cut and baled. This is evidence of the benefits of restoration of degraded area (see figure 1). Cover assessments were made in the second and third growing seasons. At the end of the second growing season, pioneer species were almost phased out. The landowner continued to cut and bale the grass during the second growing season. It was during this second season that the percentage canopy recorded for pioneer species such as Melinis repens was in the range of 0.5 – 2 %. The pioneer species had stabilised the soil giving time to subclimax species to take over. 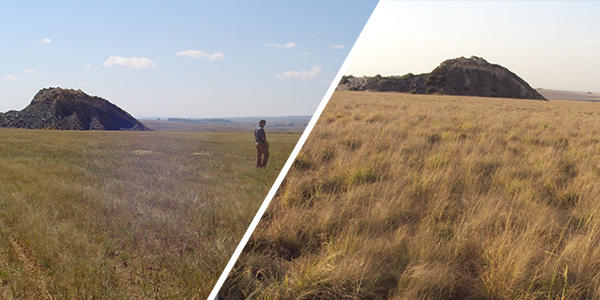 By the end of the third season, the well adapted subclimax species were increasing in number and contributing to the establishment of climax veld for extensive grazing and hay production. Cattle were introduced for the first time for grazing at the end of third season. It is during this phase of the plant succession that species which only occur in climax veld are afforded the opportunity to enter the system. No chemical fertilizers had been applied since establishment in 2011. Provided that the current management system is continued, hay production and extensive grazing will be sustained under ambient conditions. Plant succession is a process which has continued for hundreds of years and has been very important in ensuring that nature restores itself from degradation. With increased anthropogenic activities which lead to accelerated degradation challenges, it is very important to find ways which can help restore the veld on the principles of nature. MayFord Seed’s Biomosome™ Eco-Matched Veld Seed offers a lasting solution to disturbed environments by initiating plant succession and giving the opportunity to manage the process to achieve sustainable carrying capacity for livestock and game under ambient conditions rapidly.